Why Lion Who Has Never Given Up Story Is a Good Literature for Children? The developmental stage of a child could be compared to a person growing a plant. If it is not being nourished well, the plant could grow very poorly. The plant needs proper watering and regular application of fertilizer. The soil also needs to be cultivated well so that weeds could not grow. If the developmental stage of a child is neglected by parents, he or she could grow up as a person lacking values and etiquette. All parents wanted their kids to grow up as smart and full of values so investing with good literature is crucial. What your child becomes is always pointed back to you. As a parent, you should do all your best to provide him or her the best of the best resources. Why is this book good for personal development? 1. Values for life. In this book, Leo was guided by her Mom. When Leo found out that he could not scare other animals with his small voice, he ran to his mother and cried. His mother said that in time Leo will get what he wishes for through perseverance. After getting advice from his mother, Leo trained everyday to develop his vocal ability. He was disappointed because his effort seems useful but his mother still pushed him. In the end, he was able to let out a big roar that belongs to a true Lion, the King of all animals in Africa. The value of perseverance is highlighted in this book. Can this book create big impact in the imagination of a child? 2. Honing imagination. Why do you need to develop this kind of aspect in a child’s developmental process? This book contains describtive images as well as intriguing content so the child will keep on imagining things. It is good to make a child imagine because it will be the kickstart of his or her creativity. Being imaginative plays an important role when kids grow up. Being imaginative could make the young ones solve simple problems. 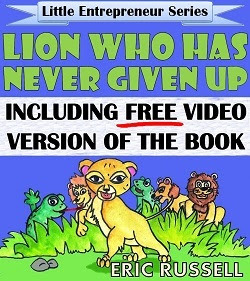 From the title itself of the book, Lion Who Has Never Given Up, the child can draw an inspiration not to give up no matter what happen. It also means that if one door closes, he or she needs to others ways to get out. Finding the right material for your kid could be a daunting task for you because you have your busy schedule at work. This book is what you’re looking for because it contains a great content which may positively impact the child’s personality. Start early and watch your child develop his or her reading skills while developing a very positive personality. You can visit us at booksfor4yearolds.net where you’ll find other developing books for kids.